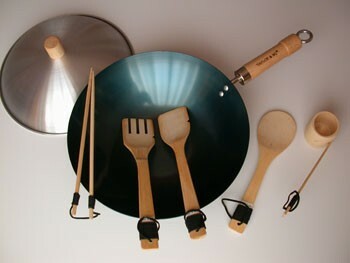 This 7-Piece Natural Nonstick Wok Set includes a preseasoned 12" flat bottom single handle wok, dome cover, bamboo utensils - fork, spatula, rice paddle, ladle, and a pair of cooking chopsticks; and a how-to-care wok and recipe booklet. Carbon Steel. Hand wash and dry. Made in Taiwan.